The 2002 iMac is definitely different with its 10.5" base and 15" flat panel display. Definitely different. Steve Jobs says the design was inspired by a sunflower. All models feature a G4 processor and can burn CDs. The less expensive models have a 700 MHz G4, and the middle of the line has a Combo drive. The top-end iMac runs an 800 MHz G4 and has a SuperDrive so you can burn DVDs. The iMac G4 was a computer that was produced by Apple from the beginning of 2002 to mid 2004. It replaced the aging iMac G3. The computer had a new design compared to older Macs. It had a 15-inch LCD which was mounted on an adjustable arm above a hemisphere containing a full-size, tray-loading optical drive and a sixteenth-generation CPU (the PPC 74xx-series). 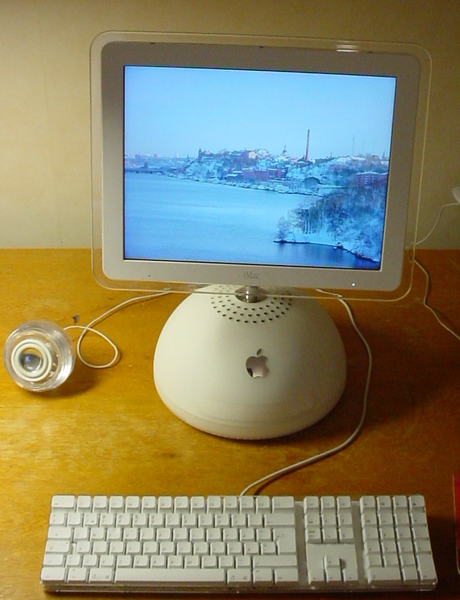 This LCD computer was known and sold as The New iMac throughout its production life, while existing egg-shaped iMac was renamed the iMac G3 and continued to be sold for a few months. 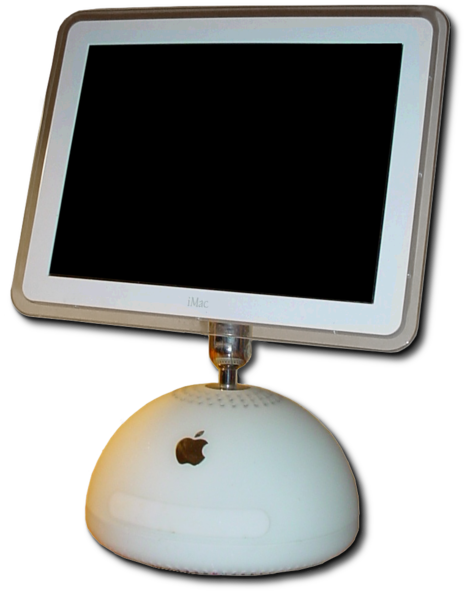 After the New iMac was discontinued, it was retroactively labeled iMac G4 to distinguish itself from the succeeding iMac G5. Apple advertised it as having the flexibility of a desk lamp and it was nicknamed the "iLamp", similar to "Luxo Jr.", who was featured in a short film produced by Pixar, another venture of Apple co-founder Steve Jobs. It was featured in an ad, sitting in a store window and "reacting" to every move made by a passer-by on the street. At the end, when the man sticks out his tongue, the iMac responds by opening its optical drive.